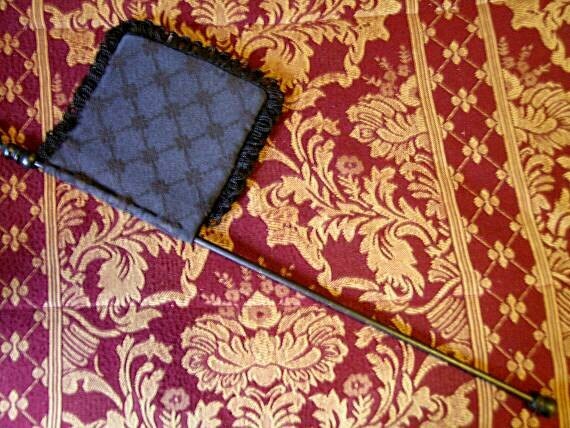 Our version of the Venetian Flag Fan is made of satin damask with a diaper (diamond) pattern which has a flower at the intersections. The flag has a buckram stiffener to make it more rigid and measures approx. 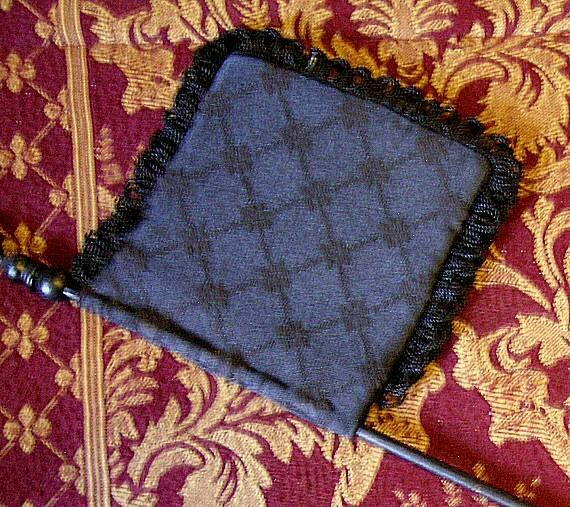 6x6 1/2" including the looped fringe around the edge. The wooden handle is painted with black enamel and measures is a little over 20" from the carved top section above the flag to the capped bottom. HISTORY: The Italian Flag Fan (also called "key fan" and "weathercock fan") was very popular in Italy during the Renaissance, especially in Venice. Called the "ventarola" in Italy, these fans were constructed of fabric (either painted or embroidered), plaited straw and parchment. They had handles of wood, metal and ivory. The more ornate ones were carried by older married women or matrons, while the newly married or betrothed ladies carried ivory or white ones.